Earn $27.49 in VIP credit (2749 points)What's This? 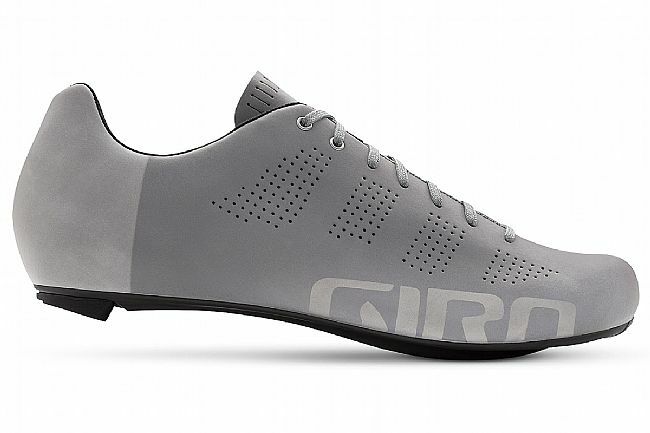 The Giro Empire ACC Road Shoe pairs a classic look with modern technology, for a high-performance cycling shoe that looks as good as it feels. 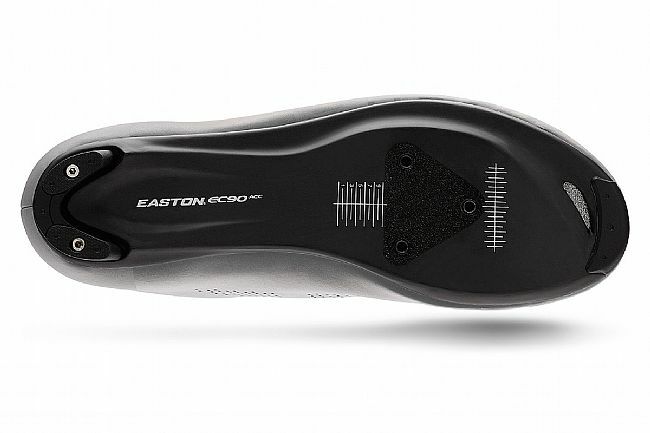 The revamped sole is full carbon, made of Easton's race-tested high-end EC90™ carbon. 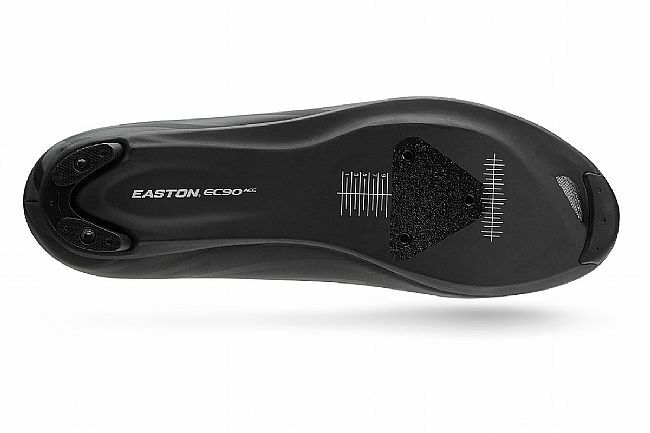 The ultra-low 6.5mm stack height provides a direct, confident connection to the pedals, and the adjustable SuperNatural Fit footbed allows for fine-tuned fit and arch support, so that when it counts, you won't be thinking about your feet at all—just about how good standing on that podium is going to feel. The classic laced closure is intuitively adjustable and looks great, too. The Evofiber™ microfiber upper is highly breathable. Heel pads are replaceable. Claimed weight: 215 grams (size 42.5). Compatible with three-bolt road cleats. I've always had shoes with ratcheting buckles or hook-and-loop straps. 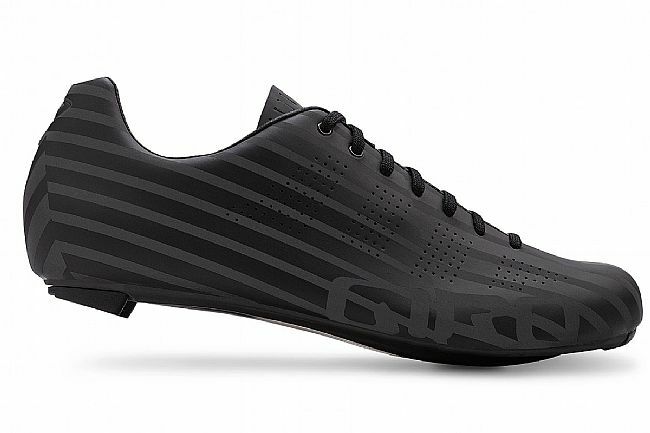 I was motivated to buy these because they are fully reflective (which is amazingly bright and effective) but had my doubts about the convenience and comfort of cycling shoes with laces. After several months, those doubts are gone. In fact, I will be sticking with laced shoes (so long as they're available, I suppose). It's easy to get them comfortably laced up, the lace garage is easy to use, and I've had zero problems with the laces. These are also my first Giros and they are stiff and fit well. I found the size charts mystifying, but I wear size 12 sneakers and went with size 47s (even though the chart recommends 46) because I wear 47s in Sidis and Shimanos. The 47s work perfectly for me. I really liked the idea of using laces to get the best possible fit. Unfortunately, the last was too narrow through the mid foot area for me and I could compensate enough by loosening the laces. I ordered the shoes in red to match my bike and kits, but they were almost orange. I sent them back back unused. I was surprised that BTD doesnt offer a return shipping charge, that is deducted from the credit, and paid $XXXX to ship them back. Worried about laces taking so much time to put on. Does take a little longer to get on but it is worth the time. Have a few hundred miles on the Giro's and can't tell much difference between first time I put them on. Break in time was very short. Feet don't hurt anymore after a ride. Sometimes it is helpful to get the perspective of someone who has actually been using a product for awhile. I've used these shoes almost exclusively through 10,000 miles of riding- they are outstanding. Super stiff sole and easily adjustable fit to adapt to wide or narrow feet and thin or thick socks depending on the weather. 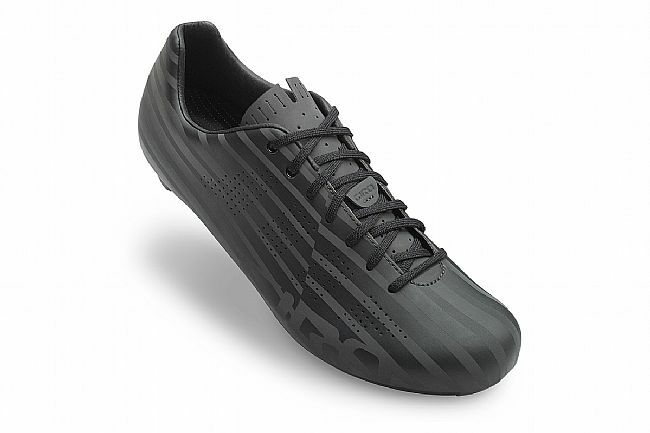 When I first considered purchasing these I was worried primarily about two things 1) The laces would flop around and get caught in the chainring, and 2) I'd have to keep stopping during a ride to readjust as there is no way to just reach down and ratchet a little up or down like with most other bike shoe fastening systems. I can't recall a single time either happened. The laces are slightly rigid and once they are tied and placed through the lace garage loop don't move at all. It is also amazing that after you tie these up prior to starting your ride, minor shifts of your foot position just shift the lace pressure to give you room where you need it. Love these shoes. 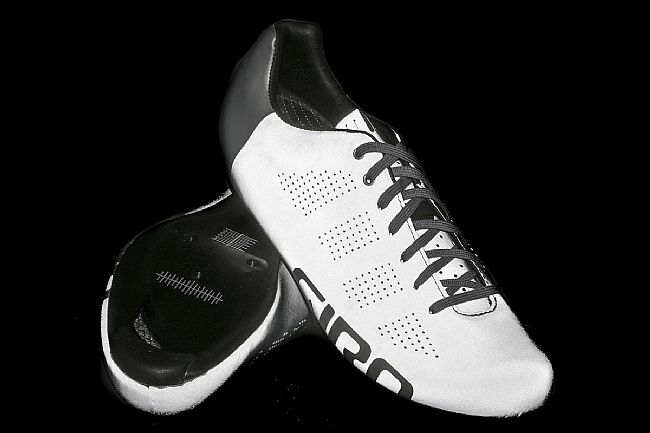 I am a big enough fan of the Giro Empires that I own four pair. The laces allow for customization of fit that is terrific....a little tighter or looser wherever you want. 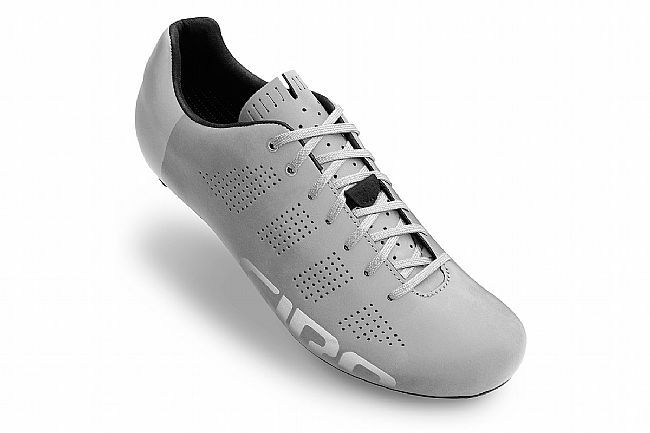 No worries about the laces coming undone as Giro has produced laces that do not come undone. They are light, they are comfortable, and they look great. Great fit true to size 49/14. Stiff and Light weight. Laces are better than buckles. Who would have thunk? Lightweight, fits well, forget that they're on my feet. Bought a second pair just to have a different color. The Empires really caught my eye when I first saw them. The old school look with modern technology got my attention. I have owned velcro as well as ratchet style roas shoes and was skeptical about laces because I like to be able to readjust during a ride. There is no need to readjust with the Empire. The laces allow a much more precise fit. They breathe well and are light, a great road shoe. Better fit than buckles and straps, old school good looks with new school carbon sole - thinner and lighter than the balsa wood soles on my old Duegis. What's not to like? I'd been waiting for these shoes to go on sale for a long while and when they finally did, I picked up a pair. They're everything I was hoping for - a great combination of style, performance, and...style! They are super lightweight and very stiff. I have really narrow feet and wasn't sure if a men's shoe would work, but with the laces you can dial in your exact fit. Roomier where you need it, tighter where you don't. I'm already planning my next pair! I came from a Fizik Uomo 5, which in its own right was stylish, comfortable and durable. However, when I slipped these on, it was a whole new world. It was light as a feather, super comfortable, form-fitting, stylish and supportive. My Fizik's weren't heavy, but these were just ridiculously light. you can feel it from the start. I expected some break-in period, but for the most part didn't need it. It didn't feel like an old fair of shoes, but it was 70% there. It didn't have extra space under the center of my feet, which I could feel with my old pair. One thing I didn't like is how careful you have to be because the outer can scratch easily. Infinitely adjustable fit through the new technology of laces!! These shoes have a stiff sole, are lightweight, look good but best of all are easy to get an exact fit through the use of the laces. I have other shoes with rachets and boas but none have the custom fit of these Giros. The shoes included Giros adjustable footbeds but I was not too impressed with these but once replaced with my usual footbeds the shoes were very comfortable. These have finally replaced the last shoes I had with laces from 1990!! I love them and the price was awesome.